Those who have followed reserved-bit this last year and are aware of its roots, would know of Science Hack Day, Belgaum. It is a 2-day event with science at it’s heart. It is a humble and enlightening 2 days, much like its organisers in India. 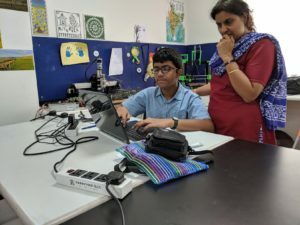 They bring together people – makers, researchers, engineers, designers, teachers, students, architects from India – for science. The first edition was last year(2016) and we returned with the idea of a makerspace wanting to emulate the wonderful 2 days forever. This year we went in to meet friends we made from last year and be part of something truly epic. Day 0 We picked up Pooja & Praveen and left early morning to reach Sankalp Bhoomi (We couldn’t ask for a better venue) for lunch. After settling down, we watched others kayak, cycle and had our share of fun with the birds and bunnies. Ira was enamoured by kernel_girl and her red hair. Later Ira met her Ovi didi and needed nothing else. Later in the evening all volunteers, organisers and speakers gathered to introduce themselves and their ideas. I missed the Mapbox folks who had done such a fab job with the organic map last year. It was great to reconnect with Minal, Praveen, Hitesh, Rahul and Rupa on the personal front. It was great to meet Shreyas and to see he had returned with a hack idea of his own this time; last year he was a keen kid trying to help me with my Cookie toy hack. What’s more, he also won a prize this year for his hack! Yay! Day 1 & Day 2 moved so fast; There was so much to do, learn and absorb. The students were divided into 2 groups on day 1 – one for soldering workshop organised by Jithin and other for science toys workshop. The groups were to swap the next day. We had a video conference with SHD San Francisco which was happening on the same day, it was phenomenal to interact with makers from the other side of the globe. Once the hack event started on Day 1, I opened my 3D pens and everyone seemed to be fascinated by them. Rakhi, Amol, Medozonuo and the others adeptly took over and since then I didn’t even have a second look at that table. There were a bunch of aspiring educators from Mysore who I had the privilege of interacting with, they were reassuring indicators of our future as a community. The demo session at the end of Day 2 had people turning up in packs to get their names printed using the pen! Medozonuo also made a beautiful witch hat for Ira that we now proudly display at reserved-bit. On day 2, right before the closing ceremony, I quickly tweaked my rainbow pendant based on adafruit’s hoop earrings with the neopixel ring to flash in blue so that it resembled the arc reactor for Hitesh to wear during the closing ceremony. It garnered a LOT of interest. The event ended on a high. A few things that will stay with me forever – the aero-modelling demo and explanation, the geodesic dome, the nursery rhymes by Shakthi and the silicon plate at the lightning talks session, Ira’s Rapunzel (on paper) who had precisely 2 strands of really long hair, the rock cottages that had a verandah overlooking a small pool with a boat in-house (no kidding!) and the beautiful rock samples that were up on display. 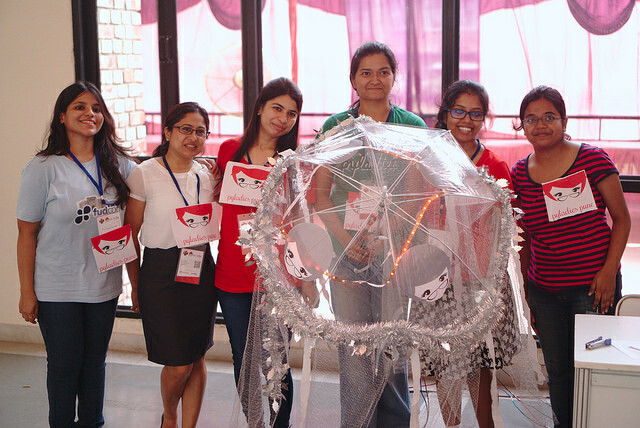 One unforgettable moment was when Pooja made a 3D model of a geodesic dome to help the team that was making a full sized geodesic dome using bamboos. That was collaboration at its best! Then there was the young biologist who held a frog in her hand and rushed to her professor and us to show the specimen she had caught. She was so careful in handling the creature and seemed to know everything about it! Building a community, especially of individuals or groups with diverse interests is tough and exciting at the same time. The core organisers of SHD Belgaum seem to make it work like a charm. I wish for more hacks next year. There is a lot of unexplored territory – artists, designers, astronomers, nature lovers, food hacks, crazy electronics and more. We left early morning the next day looking forward to visiting the Belgaum makerspace soon. It has been said many times before and deserves to be said again – Science Hack Day, Belgaum was the best technical event I have attended. A hack day is supposed to bring hackers, scientists together to create amazing things. It all happened and more. As participants and mentors, we returned inspired with new friends and more ideas. We almost cancelled and then we didn’t. What a mistake it would have been had we cancelled. The drive was great, Ira was good – we were happy. We took a detour at Kolhapur because we had to pick some stuff for the event. We left home after lunch so by the time we reached Belgaum it was late evening. Warned by Kushal about the maps, we waited for Praveen to lead us to the location. All 3 of us fell in love with the resort instantly, it was starting to feel like a vacation. Day 1 started with an informal inauguration ceremony where all mentors introduced themselves and their ideas. I described my idea too – “Smart”ifying Cookie which is based on Grant Gibson’s Chatter Smartphone. Cookie is my two-year old’s battery operated toy. On click of the soft buttons on its palms and feet, the toy sings different rhymes. My idea was to replace the existing controller with a raspberry pi (because of my then limited knowledge of smaller development boards and of course availability) and make the toy do smarter things -1. depending on the time of the day tell my kid her task – something like – “it is 2 pm, time for you to sleep” , 2. play her favorite rhymes from the internet 3. read my twitter notification and ring an alarm to indicate something at home. So the tables were set and I was all geared up to set shop next to Kushal’s so I could learn while I did my own thing. Hong came by and suggested it was a better idea to sit on different tables so that people who wanted to contribute to either ideas would be able to. I wasn’t really expecting anyone other than Ira to have any interest in what I was up to, not even Sid and Ira only because her toy was at stake. So as we unpacked, I realized I had forgotten the password to the pi and did not have a microsd adapter (foolishly, left it on the study table at home). Hitesh guided Sid to the electronic store and they got the stuff. While I was awaiting their return, a bunch of girls approached me at my table as they were interested in my idea and wanted to know if I could help them for their own project(robotic arm I think it was). Since I wasn’t ready, I redirected them towards Kushal as they were also very keen on learning Python. Rupa came up to me and expressed interest but had to redirect her to Kushal too. A shy, young boy -Shreyas- approached my table and asked me what my project was. After I explained, he told me about his projects (http://xerfia.com/). I went around exploring the venue with Ira. We went to the main hall where curious students were working on building solar lanterns. There was a glade in the resort where another set of students were making science toys. The kids were curious, sharp, well-behaved and wonderful. We could only wait around till Ira’s attention span allowed us, which is 5 minutes. Ira spent most of time looking and asking for Ovi didi 🙂 when not watching the peacock and peahen. We spoke to Poornima from the wonderful mapbox team, who were working on making an organic map of the resort. 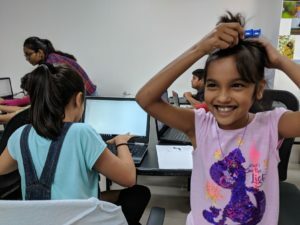 Sid and Ira left for a nap and we – me, Shreyas and Praveen- were at the table and we connected the wires to the pi’s GPIO pins and built the code. So we got stuck at a point where we wanted one click to execute the block of code just once, however it was going on in an infinite loop. We broke our head over it, over-analyzing the entire problem. Praveen debugged the code to death and back. Many others came over to understand the problem and help. Sid returned from his sleep and added a line time.sleep(1) and it got the expected result. All that was missing was, clearing the cache of the excess click inputs. We then broke down the tasks-to-do among ourselves and the work-day ended. The long day turned night ended with lightning sessions. Arun got his broken microscope an LED. A memorable demo by Prof. Prabhu on biomass burner completely blew everyone away. Prof. Praveen‘s laser show made everyone wish for a professor like him. The staff at the resort was very courteous and the food was great too. Dinner went well, kids had a great time. Next morning we set about our tasks. It was heartening to see Shreyas still interested. We got working and managed to get Cookie to guffaw on a button click. Pooja and Shreyas worked on the soldering the circuit. We were asked to assemble at 2PM at the main hall for a demo of our work. Many kids came even while we were working and found it amusing, most returned with a glint in their eyes at the possibilities. The awards were given out to well-deserving teams. At night, Rahul Khanolkar gave us a peek into his life as a researcher in bat conservation. He demoed the device they use to detect bat motion and told us some mind-boggling facts about bats. That entire episode will always be firmly etched in my memory. Wonderful experience. The delay in writing about PyCon was not just procrastination ,but also getting myself involved with too many things at the same time. I am happy to have attended this memorable event and hope to spread some cheer with this report. Beware, looooong post alert. Get your popcorn! Scroll down to Day 1 if you want to skip my personal peeve stories. 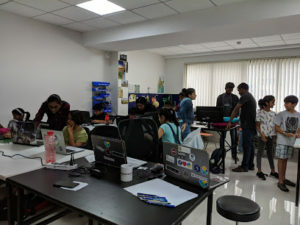 For me the first meetup of PyLadies was about learning basics of Python, I had no idea about the global community that is motivated to make a safe environment for women contributors. 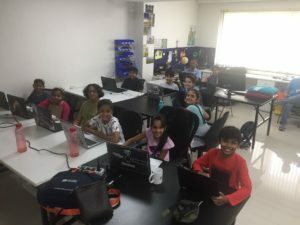 Despite being a beginner in Python, I seemed to have suggestions aplenty and it seemed to me that I could get/attract more members for the next sessions. I gave a small communication guideline talk during the second meetup and it was pretty much a sealed deal that I was happy to be a part of this community. What was most inspiring for me was the fact that Anwesha was so motivated to pull the group together, despite no clear path ahead for the group. It was disappointing that there were very few who attended regularly, nevertheless the few who did became good friends and I guess at this point we all fire each others imagination. I found out about PyCon from dgplug. The goodman was out for work and I could not imagine leaving Ira without either of us. It was not possible to attend the conference, clearly. I knew of all that was happening behind the scenes – how PyLadies did not get a table, how Rupali had, as always, returned as our knight (dame, maybe?) in shining armor. Red Hat had magnanimously opened its booth for the community and welcomed all contributors to showcase their stuff. Wow! Almost all of dgplug was attending the PyCon and there were questions about who is joining when almost all the time. One visit from Kushal and Anwesha was all it took for us to consider the experiment of leaving Ira with her grandparents for a night. Tickets were jhatapati booked and plans made for stay. Thanks to Kushal and Anwesha for letting me be the haddi in their kebab during conference days. Truth be told, my mind was constantly occupied with what would happen with Ira ever since my tickets were booked. The husband is talented which enables him to do some nice things like printing few python print t-shirts for PyLadies. I and the husband had made an LED lit jellyfish costume for Ira which was actually an umbrella based on this tutorial. Me and Anwesha planned to use it as a photo prop at the booth. My original plan was to carry Cookie(who is an annoying battery operated toy) which was to be controlled by a raspberry-pi and a simple python program. However, I wasted a lot of time and it was not ready on time and Ira was appropriately mortified to see her toy all opened up and confiscated it from me. I designed the 2 posters for the PyLadies table. Anwesha(calmly, uncharacteristically): Ok..dont worry. You get the prop. We will see what to do. By the way, can you prepare a lightning talk? Err, at this point I think I should do two posts. This is taking too long 🙂 Never mind. So on Day 0, I was still in Pune and I got the posters printed, it was raining incessantly. I PyLady-fied the umbrella by printing the geek lady and sticking it on the umbrella. I had an exchange of images with uber-talented Trishna who was supposed to print the badges. I was supposed to leave at 3:00AM in the morning, in preparing for the lightning talk and catching up with the good-man, I was awake till midnight. Ira, as if on cue, woke up sharp at 2:30AM and bawled to see me leave, making it unbearably difficult to leave. However, I had to go AND I was out with a huge suitcase – for my umbrella prop and posters. I reached the venue at 8:00AM. I finished my breakfast and went to the booth. Pravin and Pooja joined me soon. Pooja is like the backbone of the group – quiet, calm and extremely resourceful. I was so glad they were there. We started with setting the booth. Trishna, Janki, Kushal and Anwesha joined us and the posters were up in no time. The Red Hat guys were busy with setting up their booth too. It was a very bustling, colorful booth. I had goofed with the controller for the LED which the cute-couple (Pravin & Pooja) quickly fixed and our umbrella was glowing 🙂 The photo prop was a huge hit. PSSI announced Dr.Ajith Kumar B.P, a scientist at Inter University Accelerator Centre, as the winner of “Kenneth Gonsalves Award 2016”. What inspiring work! What was most inspiring is the enthusiasm the achievers have in doing more, contributing more. Keynote by Baishampayan Ghose was a very interesting start to the conference. I was introduced to Devi, the veteran contributor and mom. It was lovely meeting her, personally for me because I aspire to be working like her. I also found out about anandology.com, which I am referring nowadays to practice some python exercises. Vijay Bung had an interactive Request for Volunteers and suggestions session at the open spaces. Me and Pooja attended it. This was in continuation with the Python month as organized by PSSI. Some valuable suggestions were noted and we made way to lunch. Rupali ended up being alone at the booth managing Red Hat and PyLadies single-handedly for some time. Rest of the day was spent mostly at the booth talking about the how, when, what and why of PyLadies, Pune chapter. It was heartening to see so many women contributors come up and share their stories, encouraging for us as a team to keep up what we are doing. I went on to complete the lightning talk and submitted a proposal for the upcoming FudCon in Phnom Penh and crashed to a dreamless sleep. Kushal left early because I was taking too much time *giggles*. Me and Anwesha barely made it for breakfast thanks to our (not) wonderful driver #sarcasmalert who took ages to reach us. The previous day Anwesha had spoken to Paul and Van about organizing a session by PyLadies about how to grow the community. So we were all set to organize the same at the open spaces. Since this was my first conference, I made the blunder of presuming and not checking with the volunteers about availability of the open spaces; went by the literal meaning – the space ought to be “open” for anyone. The very enterprising Janki got into her element and got us one slot at 11AM by successfully negotiating with the speaker who had the slot. We are grateful to Udayan for the slot. I missed thanking him personally at the venue. The session went very well, we actually ran out of time. Unfortunately, all slots for lightning talks were taken for day 2, in fact they had some talks spilling over from the previous day. So my lightning talk will make its way to the next meetup 😀 I personally loved the idea of a 5-minute platform to strut your stuff very helpful and interesting. We also had a #dgplug stairway meeting. I was elated to be part of such a vibrant and promising group. We met again for a photo later towards the end of day. PJP dropped me to the airport, while I regaled him with a report on my life. Whether he wanted to know or not was never a question 😀 I also finished reading Scion of Ikshvaku since I had 4 hours to spend at the airport. Yayy! We had noted contact details of the women who visited us at the PyLadies booth. The idea is to get in touch with them and have sessions with them via Hangouts for our future meetups to keep in touch with what is happening in various fields w.r.t Python – exchange of information forging a multi-culture community. So while casually chatting with Anwesha I found out about the second workshop at PICT(Pune Institute of Computer Technology) to be conducted by Kushal. I checked if I could join him for the workshop, primarily to learn and secondly to understand how a workshop is to be conducted. 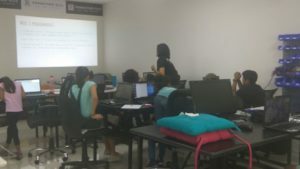 The first workshop was Introduction to Python by Kushal and was a huge success with 40 girls attending it. This workshop was an extension, as requested by the students. Anwesha had introduced PyLadies, Pune chapter in the previous workshop and had met with a very enthusiastic response. On our way, instead of discussing the talk, me and Kushal spoke about the world in general 🙂 So the topic was as new to me as for the participants of the workshop. We had a small felicitation event with the very knowledgeable HOD and the professors extending a very warm welcome to us. The students were trying their best to ensure we had everything we needed. So the workshop began and I found out (well belatedly!) that the topic was the argparse (command-line parsing module in the Python standard library) module. We ended the session with some gyaan about work ethics, the open source way of life, contributing to open source projects, importance of hard work, even disclosed pay packages of some contributors (gasp! ), how to get on IRC, PyLadies, PythonPune and so much more. PyLadies is ONLY for ladies? We are focused on providing a support network for everyone, primarily ladies. My first Python Pune meetup was for the Docker basics session hosted by Chandan Kumar and conducted by Suraj Deshmukh. It was a good workshop to understand how Docker works. About 40 pythonistas met at the meetup. The Python Pune meetup page is buzzing ever since the workshop with comments, questions, photos and updates. Nice place to learn and meet new people. 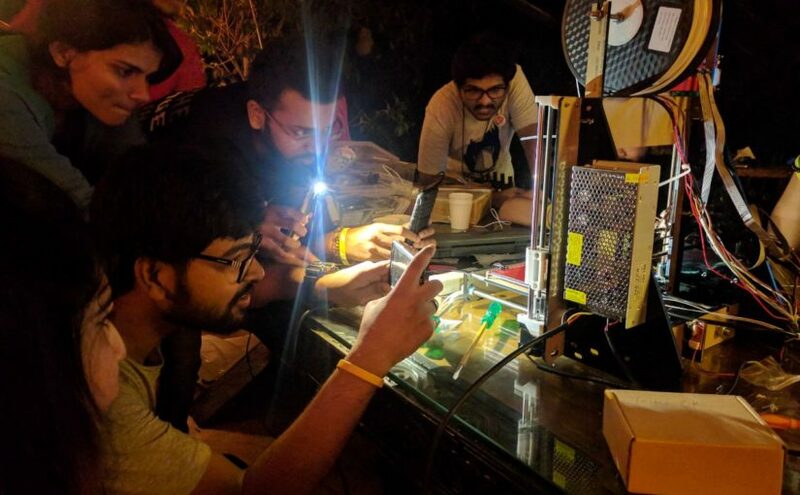 The Reboot that happened for the Pune chapter started small. It is therefore, heartening to see new faces for our regular meetups as much as it is energizing to meet the regular ones. I try and drag my husband to the meetups whenever possible. Frankly, it doesn’t take much effort as he gets to meet his friend too. This meetup was supposed to start with a small demo by me on real-life applications of Python. My current project is my daughters battery-operated toy. I am trying to make it, well, smarter by replacing its existing controller with a raspberry pi. However, my daughter was mortified when she saw her “Cookie” all opened up and took it away from me. So I need to come up with better tricks to lay my hands on her toy without her knowing it and changing it for the better (better for me, of course!) I ended up giving a description of what I am trying to do. Also, discussed a few other automation ideas I have and where to get the components from. Next was going to be Trishna‘s workshop on “Using Web API in Python3”. I had already heard so much about her from everyone that I was really excited and looking forward to attend her workshop. She didn’t disappoint one bit. Not only had she come prepared with a great problem statement, she also brushed up on Python basics for us beginners. She introduced the requests module before we took a break for lunch. The problem she wanted us to work on was to use the ZOMATO API and come up with a list of Chinese food joints around our location. Now who would not like that – food that too chinese food 😀 She coded along with us as we worked on the problem. It was a great workshop, where we understood each term that we typed. We were all set to explore the API on our own. Anwesha has put out a request for blogs from all participants and we need to come up with our next meetup date. It takes expertise, patience AND luck to get people together for a cause and organising a technical event gets all these skills to the fore, as I observed today. I attended the PyLadies Pune Chapter today. Today was an re-introductory session to infuse life into the group of women python-lovers in the city. The event is open to everyone. The day started with an introduction from the very-cool-lawyer Anwesha. She introduced PyLadies to us newbies in an uncomplicated and clear manner. The next session was by Kushal, who showed pictures from PyCon 2015 and told us backstories for each of his amazing clicks. Each story was amazing, tracing the journey of people associated with Python. It gave us a glimpse of the vibrant community in all its glory as also the depth and breadth of Python in the industry. He left us with a mind-blowing keynote from PyCon 2016 by TwoBraids (K Lars Lohn). Post-lunch session we learnt and practiced the basics of python. Very interesting for yours truly, sharpening her slightly rusted skill set. Overall the response to today’s event was good, the original PyLadies started with lesser members you know. It was heartening to see pythonistas, irrespective of gender, working towards reviving the group. I have married a geek and that is how I got to know about the #dgplug summer training, to put it simply. My husband has arm-twisted everyone in the family to use only Fedora on their computers and is dismissive of any other way of being. So I was aware of the open source way, used it, admired it but never got to doing much about it. Eventually, the job became less and less about the work and more and more about the people doing the work. I started itching to do something on my own. Also large multinationals rarely gives you opportunities to do something new and doing something on your own is unthinkable. I was done with being a stooge for the company, however, lacked the courage to foray out on my own and after having taken the plunge to quit, I rejoined meekly (yes I did. Yes I am ashamed. Now can we move on?) in less than 3 months. The game changer for me was my forced-break during my pregnancy. My daughter, while still inside my womb, forced me to be on bed-rest for a good 2 months before she decided she had enough fun at my expense and wanted to make her appearance for everybody else. Takes after her dad, my little girl. This time I utilized to read and read I did about a lot of things including technology, discussed a myriad things with my ever-enthusiastic-husband. My thoughts aligned with the freedom granted by the open source culture and I decided to equip myself with some knowledge and contribute to the community from whom I have only gained so far. Jobless and opinionated, I was all geared up to learn till I realised parenting meant a lot of hard work and was time consuming. I learnt to count. I had only two hands and decided to take it slow. * We are into the sixteenth year of the twenty-first century, knowing how-to solve a problem is not the major debate. Listing problems that can be solved and prioritizing them, in my opinion, is what will make us tick. I am looking forward to the remaining sessions over the next 3 months and take my journey of over a thousand steps forward.